Increasing number of gyms and health clubs coupled with government efforts towards promoting physical fitness are driving the growth of fitness equipment market in India. In 2017, the Central Government of India has ordered all its offices to facilitate gym facilities. In addition to this, the Department of Personnel and Training (DoPT) is promoting gym set-ups in offices by providing monetary compensation to offices. Additionally, growing consumer preferences towards physical fitness due to surging lifestyle diseases is further pushing the market growth. In terms of market sub-segments, treadmills and stationery bikes emerged as the most preferred cardiovascular training equipment in 2016, however, on account of higher calorie burn ratio, elliptical cross trainers are expected to register higher growth over the coming years. According to 6Wresearch, India fitness equipment market size is projected to grow at a CAGR of 15% during 2017-23. The Western region bagged highest revenue share in 2016 with Maharashtra being the major contributor towards the growth of fitness equipment market in particular region. However, over the coming years, the Northern region is projected to exhibit highest growth on account of higher adoption across key states including Punjab, Haryana, Delhi/NCR, and Uttarakhand. Among different end-user applications, gyms and health clubs bagged highest revenue share in the overall India fitness equipment market share followed by commercial applications. In-house fitness centers and health clubs are gaining popularity in fitness equipment market. Hotels, offices, public corporations and educational institutes are offering gym facilities within their premises. Additionally, the commercial segment is forecast to exhibit highest growth in India fitness equipment market forecast period. The India fitness equipment market report thoroughly covers market by types, end user applications and regions. 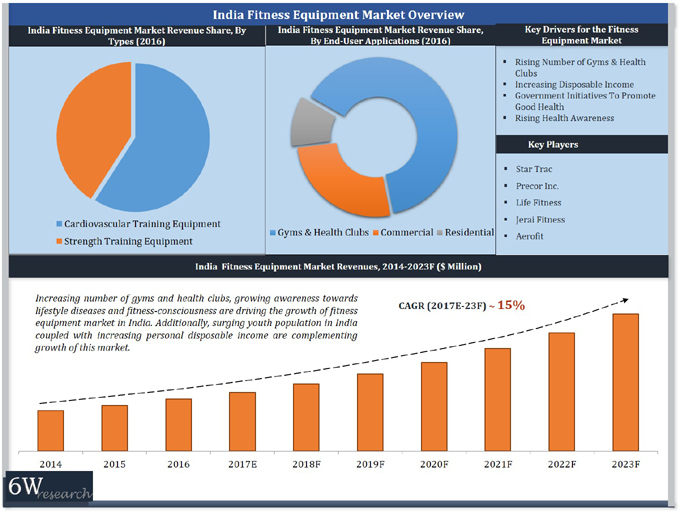 The India fitness equipment market outlook report provides an unbiased and detailed analysis of the on-going India Fitness Equipment Market trends, opportunities/ high growth areas, market drivers which would help the stakeholders to decide and align their market strategies according to the current and future market dynamics. 12.1	Jerai Fitness Pvt. Ltd.
12.2	Acme Fitness Pvt. Ltd.
12.3	(Aerofit) Nityasach Fitness Pvt. Ltd.
12.7	Hoist Fitness Systems, Inc.